Access to tens of thousands of videos is provided to the USF community by the Library. In our extensive streaming video collections, you can search full-text transcripts or browse by topic. You can also title-search or browse the library catalog to find all our video titles, including more than 2000 DVD and VHS videos that are not available in streaming format. 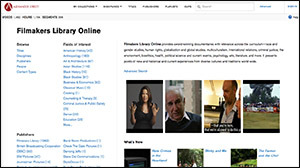 Films On Demand delivers nearly 24,000 educational online videos ideal for students and faculty. 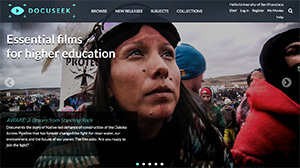 Docuseek provides 1800 social-issue and environmental documentary films from leading documentary film distributors. 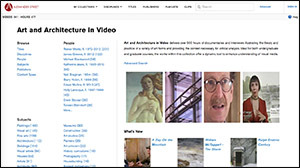 Art and Architecture in Video delivers over 500 hours of documentaries and interviews illustrating the theory and practice of a variety of art forms and providing the context necessary for critical analysis. Ideal for both undergraduate and graduate courses, the works within this collection offer a dynamic tool to enhance understanding of visual media. 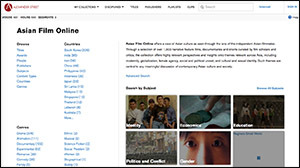 Asian Film Online offers a view of Asian culture as seen through the lens of the independent Asian filmmaker. 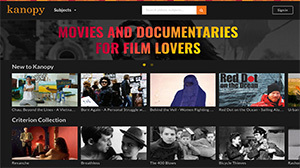 Through a selection of hundreds of narrative feature films, documentaries and shorts curated by film scholars and critics, the collection offers highly relevant perspectives and insights onto themes relevant across Asia, including modernity, globalization, female agency, social and political unrest, and cultural and sexual identity. This series contains more than 2,500 hours of footage from actual therapy sessions, training videos, and reenactments conducted by renowned counseling professionals. Perhaps the greatest source of anxiety for students in the mental health field is the prospect of working with clients in face-to-face counseling encounters. 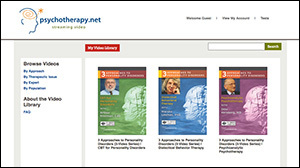 The five-volume Counseling and Therapy in Video Series provides an invaluable firsthand look at the realities of working with clients and the challenges associated with putting theoretical concepts into practice. Dance in Video is the definitive video collection for the study of 20th Century concert dance, featuring the most influential performers and companies together with dozens of documentaries, interviews, and dance instruction videos—comprising 500 hours of high-caliber content. 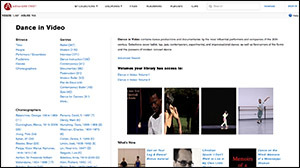 Dance in Video provides coverage in breadth and depth for modern dance forms, and is relevant to dance history, dance analysis, dance instruction. Invaluable resource as dance is an inherently visual medium – content includes coaching sessions and recreations of past choreographers works. 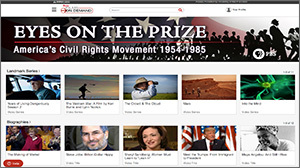 The films in the Media Education Foundation (MEF) Collection encourage critical thinking about the social, political, and cultural impact of American mass media. With a special focus on representations of gender and race, and the effects these representations have on identity and culture, MEF films are especially well-suited for use in Women's Studies, Sociology, Race Studies, Communication, Anthropology, Education, and Psychology courses. 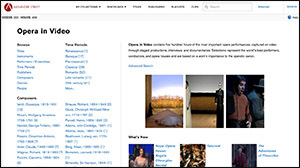 Opera in Video contains five hundred hours of the most important opera performances, captured on video through staged productions, interviews, and documentaries. Selections represent the world’s best performers, conductors, and opera houses and are based on a work’s importance to the operatic canon. 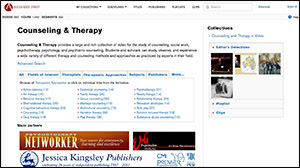 Psychotherapy.net features the richest and most diverse collections of high quality training videos in the field of counseling, psychotherapy, and addiction. The majority of the videos show therapists actually conducting therapy and demonstrating clinical skills, along with pre and post session discussions. Most of the leading figures in the field are included in this collection, from legendary masters such as Carl Rogers, Albert Ellis, Rollo May, and Salvador Minuchin, to contemporary luminaries such as Irvin Yalom, Marsha Linehan, Sue Johnson, William Miller, Insoo Kim Berg, and Otto Kernberg. Diverse formats geared for a variety of teaching needs, including single-session demonstrations, multiple-session demonstrations, clinical case consultations, interviews, and documentary style films. Most use actual clients, although some are reenactments. Many videos include voiceover commentaries throughout sessions, increasing their instructional value. Videos presenting most major theoretical orientations, including cognitive-behavioral, psychoanalytic/psychodynamic, family systems, existential-humanistic, motivational interviewing, and many others. Most modalities, including individual therapy, group therapy, couples and family therapy, child therapy, art therapy, psychodrama and therapeutic communities. A wide representation of client populations. Most video titles include downloadable Instructor’s Manual. 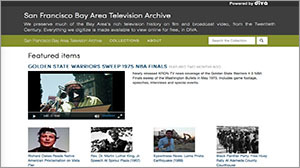 The San Francisco Bay Area Television Archive preserves much of the Bay Area's rich television history on film and broadcast video. As archive videos are remastered, they are made available online for free. 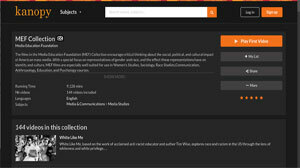 Thousands of streaming documentaries and feature films available by faculty request, usually for one-year licenses. Order directly from the Kanopy link or contact your library liaison for assistance.